This is a really great Arthur Wood large jug with a beautiful floral design (spring flowers) on both sides. It has a pale yellow ground to the design with silvered motifs around the floral main picture. The jug is in very good condition with no chips/nibbles (see below). There is some light crazing in the bottom of the inside of the jug and around the bowl and some light fading to the gilding around the rim. However, the underside of the base has two small nibbles (see photo) unseen when the jug is displayed. Underneath, the stamp indicates the design number 6956 with a further designation in black which I cannot entirely decipher. Otherwise, there is no deterioration. It measures 5.75 inches (13.5 cms) tall with a top diameter of 4.5 inches (11 cms). 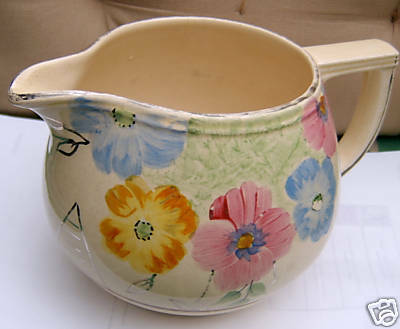 From spout tip to handle edge it is 8.5 inches (21.5 cms), so quite a large jug overall.